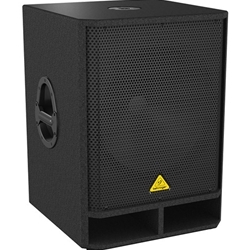 Ensure your live sound system has the bass it needs with the Behringer Eurolive VQ1800D powered subwoofer. The 500-watt Class-D power amp delivers deep bass through a single 18" woofer. A built-in stereo crossover lets you optimize the sound between your subwoofer and main speakers for maximum punch. Gigging gear can take a beating, and the VQ1800D's rugged exterior and metal grill ensure long life and survivability. Bring chest-pounding bass to your live rig with the Behringer Eurolive VQ1800D powered subwoofer. The speaker management features on the VQ1800D make it easy to set up your system. Connect your main mix to the stereo inputs of the sub, then connect your main speakers to the hi-pass-filtered outputs. Then adjust the variable hi-cut frequency for the sub to find the perfect balance between sub and speakers. And if you need to add-on even more speakers to your system, the VQ1800D gives you an additional two full-range outputs.